The table at the back of the Hayes Room in Montpelier’s Kellogg-Hubbard Library holds a colorful bounty of prepared dishes. There’s a pot of venison chili, a slab of broccoli quiche, a loaf of freshly baked zucchini bread and a bowl of salad made with eggs laid that morning by backyard chickens. There’s so much food that no empty spot is left on the table. But that’s good, because there are a lot of mouths to feed. About 65 people have squeezed themselves into the small community room on this Saturday afternoon — the highest turnout yet in the many months the event has been recurring. The participants have brought an abundance of provisions, but they’re here to talk about a dearth — specifically, an impending dearth of oil on the planet. It’s not a topic that would draw most people out of bed, let alone to a meeting in a stuffy library, on a sunny weekend day. But increasingly, at least in central Vermont, peak oil is on people’s minds. And understandably so. A growing body of scientific evidence suggests we have reached, or will soon reach, the point at which half of global oil reserves are gone. And considering that everything from sneakers to computers to contact lenses is made from oil, that prospect threatens life as we know it. The potluck is one of a handful of events organized by Transition Town Montpelier, a diffuse but burgeoning social movement dedicated to helping people build resilient communities to prepare for the twin challenges of peak oil and climate change. The Montpelier group is one of 90 official Transition Initiatives operating in the United States and one of 360 such efforts worldwide. The idea underlying a Transition Town is that, currently, communities are not prepared to weather a major climate disaster or energy crisis. Much of what we consume is made with oil or requires oil to get to us. We rely heavily on imports, because local economies provide only a sliver of what we need to survive. As crude oil prices climb and increasingly extreme weather events wreak havoc around the world, some communities are seeking ways to deal with what they consider inevitable changes. If oil becomes so scarce that it’s prohibitively expensive or disappears altogether, how will we carry on? Transition Initiatives help people prepare for and adapt to a future beyond fossil fuels through the two pillars of transition philosophy: relocalizing and reskilling. The movement’s devotees reason that, by producing some or much of what we need in our own communities — food, clothing, medicine, building materials — we will be able to withstand severe climate, energy and economic shock while actually improving our quality of life. “This is an opportunity to take the future in our own hands,” says Carolyne Stayton, executive director of Transition United States, based in Petaluma, Calif. Rebuilding local agriculture and food production, localising energy production, rethinking healthcare, rediscovering local building materials in the context of zero energy building, rethinking how we manage waste, all build resilience and offer the potential of an extraordinary renaissance — economic, cultural and spiritual. Not surprisingly, the transition movement found a home in Vermont. In addition to Montpelier, which has the largest, Charlotte, Hardwick, Manchester, Putney and Shelburne support Transition Initiatives. Many of the practices Hopkins advocates — robust local food sourcing, natural building — are already happening on some level in the state. That doesn’t mean Vermont is prepared to handle the fallout of a cataclysmic energy crisis — say, grid failure for an extended period. But, overall, the state is better off than most, Stayton says. Transition Town Montpelier was founded three years ago as a spin-off of a postcarbon sustainability group. Since then, the movement has ballooned and now boasts more than 1000 members, according to its website. It encompasses nine working groups covering topics ranging from health and wellness in a post-oil world to root cellaring and seed saving. One of those working groups has been collaborating on an Energy Descent Action Plan, or what its authors call a “vision of a powered-down, resilient, relocalised future” — a blueprint for survival as we hike down from peak oil’s summit. Carl Etnier is one of the founders of Transition Town Montpelier, along with Annie McCleary and George Lisi. For Etnier, transition, or creating sustainable post-oil communities, is an idea whose time has come. The longtime peak-oil activist had been doing slide shows on fossil-fuel decline when he happened upon Hopkins’ book. Etnier liked the inclusivity of Hopkins’ approach, as well as its strong participatory and celebratory aspects. Hopkins doesn’t just tell people the bad news — he gives them practical, hands-on suggestions for buffering themselves against the effects of peak oil and climate change. For example, planting public edible spaces, instituting a local currency and learning to make a root cellar are some of the ways people can contribute to transition. If Transition Town rhetoric sounds a bit back-to-the-land-ish, that’s because they share many principles. But the transition movement in Montpelier, and around the globe, isn’t just for homesteaders, homeschoolers and survivalist types. At the recent potluck, attendees ranged from octogenarian knitters to thirtysomething natural builders to corporate retirees new to the area. While transition is not yet mainstream, it’s anything but fringe. The movement attracts all kinds, including climate activist and widely published writer Bill McKibben of Ripton, who sees Transition Initiatives as powerful allies in the fight against global warming. “I think [Transition Town is] creating deeply powerful change in many towns and helping them get ready to hunker down against a century of hard weather and economic shift,” McKibben writes in an email. Nor is the movement about romanticizing the past or wishing to go back in time. Transition Initiatives have benefited greatly from modern technology, and participants don’t suggest eschewing computers and cellphones in favor of letter writing and telegrams. But transition advocates are in favor of a future that’s less reliant on oil and more focused on local systems and communities. That vision is increasingly attractive, both around the world and here in Vermont. As Transition Town Montpelier grows, it’s picking up participants along the way. Here are brief snapshots of some of its members. 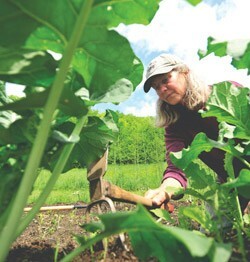 Annie McCleary works in her herb and vegetable garden in Woodbury. Photo by Jeb Wallace-Brodeur. If there is one person who’s prepared for the upheaval of a post-peak-oil world, it’s Annie McCleary. She came to Vermont in the early 1980s to homestead and never looked back. She can darn her own socks, mend her own clothes, can her own food and make her own herbal medicine. And she is happy to share those skills with anyone willing to learn. McCleary, who owns Wisdom of the Herbs School in Woodbury, is a spitfire of energy wrapped in clothes mended many times over. She is devoted to her 4000-square-foot garden and the many plants and animals that inhabit the woods around her home. During a recent interview, McCleary pauses to catch a hummingbird in her hands after it wanders into her garage and becomes disoriented. The 63-year-old came to the transition movement in 2008 by way of a local sustainability group in Montpelier. McCleary has believed for decades that the planet is changing dramatically, she says, but she wasn’t sure what to do about it. The Transition Town model gave her a road map for moving forward. Rather than fret about potential changes on the horizon, McCleary, like others who subscribe to transition philosophy, sees them as opportunities. She’s looking forward to humanity slowing down and turning inward. And she’s enjoying the conversations that have already happened about how to prepare for a future with less. McCleary realizes not everyone is going to emulate her and go back to the land. But the point of transition isn’t purism; it’s about the adaptability and resilience people need to improve their postcarbon options. Natural builder Ben Graham stands in a greenhouse addition he is building in Montpelier. Photo by Jeb Wallace-Brodeur. When Ben Graham was an architecture student at Rhode Island School of Design, his professors questioned his passion for natural building. They didn’t consider making dwellings from cob and clay sophisticated enough to be called architecture with a capital A. But Graham was undeterred. Years later, naysaying professors be damned, Graham is on the cutting edge of sustainable architecture and design. And he’s spreading his skills and knowledge as chair of Transition Town Montpelier’s newest working group, focused on shelter. 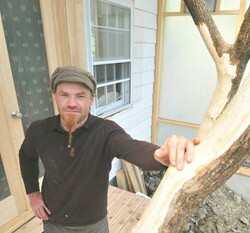 Graham, a 36-year-old with a long, red, braided goatee and wild eyebrows, has been a builder for as long as he can remember. He comes from a family of builders, and the trade is in his blood. He loved tinkering in his father’s workshop and making models; that he would go into architecture was a foregone conclusion. Originally from Cleveland, Graham moved to Vermont in 2000 after falling in love with the state during a bike trip. Shortly after, he started his own company, Natural Design/Build. In 2001, he built his first straw-bale house. For Graham, the Transition Town model of relocalizing melds with his own design principles — using “bioregional” materials to build ecologically sound dwellings. His building materials aren’t made from petroleum and come primarily from the earth. “If you said, ‘OK, you can build this house out of foam and aluminum siding and pressure-treated wood. Or you can build this other home from trees and dirt and reeds.’ And it’s, like, duh, you know?” Graham says as he sketches the stairs for a greenhouse he’s building. Not only does he believe natural building makes sense in terms of energy consumption and resource management, but, Graham says, it represents how humans were meant to live. We aren’t built for living in concrete structures with vinyl siding and fiberglass insulation, he claims. In an effort to spread the gospel of natural building, Graham helped found Village-building Convergence, a sustainable skill-sharing conference of sorts that is part of Transition Town Montpelier. On June 14, Graham, who regularly teaches at Yestermorrow Design/Build School in Waitsfield, will present a workshop on practical solutions for sustainable shelter. He’ll remind participants that, with all the mainstream “greening” of home construction these days, it’s easy to forget that people have been living in natural structures forever. 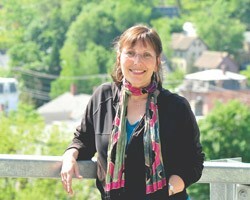 Transition Town Montpelier steering committee member Deb Lisman. Photo by Jeb Wallace-Brodeur. If there is an archetypal Transition Town member, Deb Lisman isn’t it. Until recently, she held a corporate job, admits she’s no good at gardening, and has always held a dim view of activism. But for the last two years, Lisman has been knee-deep in all things transition. She wants to learn how to homestead. She’s becoming well versed in emergency-preparedness strategies. And she’s working to build a network of neighborhoods in Montpelier, where she lives. This transition to Transition Town happened concurrently with what the 53-year-old calls a “midlife crisis kind of thing.” She was working in leadership development at Green Mountain Coffee Roasters when she decided she needed a change. She took a four-month sabbatical to help her figure out her next move. During that time, Lisman, an enthusiastic talker with short, dark hair and an eager smile, researched numerous topics, hoping one would spark her interest. She kept returning to sustainability. In 2008, Lisman went to a lecture given by Naresh Giangrande, a cofounder of Transition Town Totnes. She was hooked. “It was completely positive community building. It was about creating a resilient community that has much more of a sense of community,” Lisman says. So inspired was Lisman by the presentation and the concept of transition that she began working on her own community’s resiliency by building a website aimed at connecting her neighborhood. The neighborhood network never quite took off, but Lisman’s organizing gusto caught the eye of McCleary, as Transition Town Montpelier was just getting off the ground. McCleary asked Lisman to consider joining the group’s steering committee. She bought stacks of books on peak oil, community building and local food systems. She participated in workshops on gardening. She tried to figure out how to make her lifestyle more sustainable. All of it was outside her comfort zone. Except she doesn’t. She’s not perfect, but she’s embraced transition. Little by little, Lisman is making changes in her life, the biggest being readying herself to handle some kind of crisis. A year ago, Lisman quit her job at GMCR. In that time, she has been working on NeighborNet, an initiative aimed at connecting people who live in close proximity. She has designed a curriculum for neighborhoods to determine how prepared they are to weather an emergency such as a power outage — or, closer to home, serious flooding. The seven-week course revolves around a series of potlucks where neighbors examine key areas of survival and preparedness. People who feel informed and connected will experience less panic if a crisis does happen, Lisman says. Rather than giving her discussions a doom-and-gloom tinge, Lisman tries to make them fun — hence the potluck format. That way, drawing participants becomes more of a pull than a push, she says. Lisman’s zeal for neighborhood organizing and emergency planning still surprises her. But she’s settling into her role and growing more comfortable by the day. Wayne Ohlsson of Montpelier. Photo by Jeb Wallace-Brodeur. Wayne and Jan Ohlsson were living in Salt Lake City when Wayne first picked up a copy of The Transition Handbook, Rob Hopkins’ post-peak-oil manual. Having been interested in alternative energy since the 1970s, Wayne was intrigued by the guide and its strategies for building resilient, fossil-fuel-free communities. But no one in Salt Lake seemed to get it. Or, if anyone did, the Ohlssons couldn’t find them. So, when Jan retired from her management job at 3M Health Information Systems, the couple began seeking a new home where transition was understood. After much research, they settled on Montpelier, which seemed to have a vibrant and growing Transition Town movement. The couple have been in Montpelier only nine short months, but already they’ve rolled up their sleeves and started to work. Jan is interested in local food systems, while Wayne is passionate about developing Transition Town Montpelier’s Energy Descent Action Plan. Together they’ve been working on a project that would marry elements of the state’s farm-to-plate initiative with a more comprehensive sustainable energy plan. Both Wayne, 66, and Jan, 64, are no-nonsense midwesterners who met as undergrads at the University of Michigan. 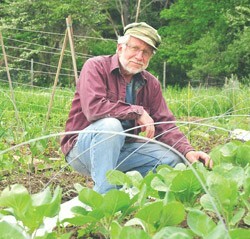 Wayne, who has a shock of white hair and sky-blue eyes, spent much of his career as a medical researcher, but harbored a desire to run a sustainable mini-farm. Jan, a matter-of-fact woman who is not afraid of a challenge, has always loved canning and preparing the food her husband grew. Together they make a formidable, motivated team. As they explain their work with Transition Town Montpelier, the Ohlssons talk over each other, such is their enthusiasm. They finish each other’s sentences as they convey their seriousness about creating change to protect their community from what they see as the inevitable end of the oil age. But, as passionate as they are about transition, the couple are realistic enough to know that many people find discussions of peak oil alarmist and off-putting. They understand that not everyone can do everything in service of transition ideals. The Ohlssons’ flexibility sets them apart from some of their Transition Town compatriots. But they still feel part of the community and enjoy the camaraderie that comes with the movement. They believe it’s designed to make room for all kinds. “Everyone can find their niche,” Wayne says.